Having a hard time getting the right answer? 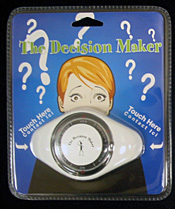 Let the Decision Maker help you! Ask a question, touch the pads underneath, and release! A red light rotates around until you let go. Light stops at one of these answeres: Maybe/Go Ahead/Yes/Try Again/Give Up/No. Great fun at reunions and events. 1. 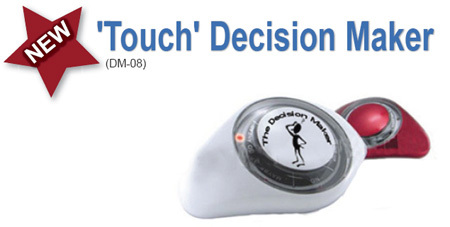 Make your own two-hands-on ‘decision’ by touching both ends of Decision Maker. 2. Flashing LED Lights sweep around. 3. The answer is indicated when you release hand-hold on 1 side! 1. Each person holds 1 end of unit and touches each other to close the circuit. 3. 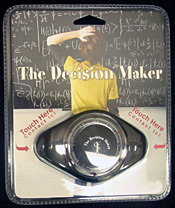 The answer is indicated when the hand-holding circuit is ‘broken’ by any one of several ‘contacting’ players.